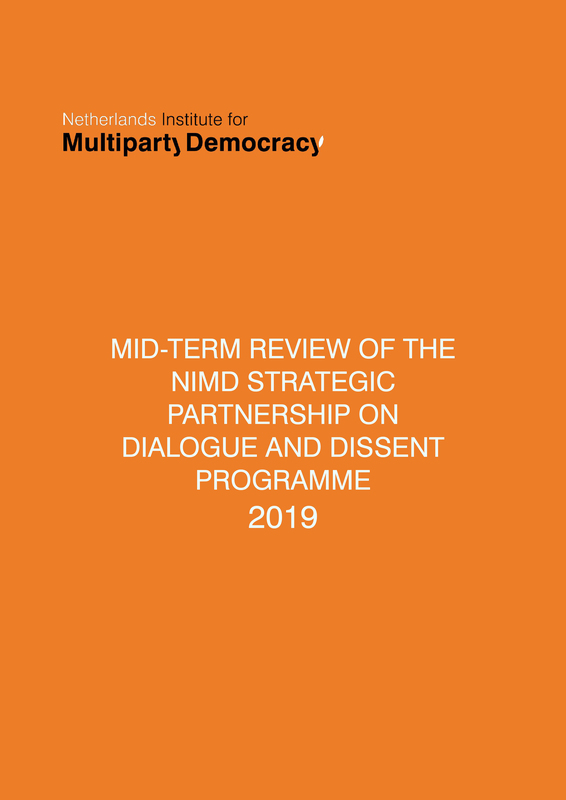 The Netherlands Institute for Multi-Party Democracy (NIMD) entered into the Strategic Partnership for Dialogue and Dissent (SPDD) with the Dutch Ministry of Foreign Affairs (MFA) for the period 2016-2020 with the programme: “Conducive Environment for Effective Policy Influencing: the Role of Political Parties and Parliaments”. The programme aims to contribute to a conducive environment in which political and civic actors can effectively influence political processes to advocate for inclusive and equitable social change. A Mid-term Review (MTR) was conducted by MDF in 2018, and assessed programme performance in all its 14 countries and international activities in terms of relevance, effectiveness, efficiency and quality of partnerships. Concerning relevance and quality of overall programme design, the MTR positively assesses the conceptual logic of the programme, including the adoption of a Party-Parliament Nexus approach. The programme targets the niche of influencing political actors (parties and parliamentarians) in becoming more receptive to inputs from civic actors in the policy process and does so by addressing both systemic and human factors. The logic of programme interventions is furthermore explicitly articulated in both – overall and country-specific ToCs. At the same time, however, the programme is overly ambitious given that it sets out to work on a multitude of factors, largely beyond its control. Programme ToCs could be strengthened by the scope that distinguishes between variables internal and external to the programme (including assumptions) that are within or outside its capacity to influence. Concerning effectiveness, the MTR distinguishes achieved intermediate outcomes from early signs of progress towards outcomes. Following desk study of the SP progress reports, it appears that effectiveness at intermediate outcome level is reasonable to good, especially in quantitative terms, although quite some variation can be observed between countries. Another point of concern relates to the effectiveness in qualitative terms, as reported programme results often miss the information needed to judge their true value (e.g. which parties took part in the dialogue and at what level). The MTR distinguished achievement of intended intermediate outcomes from early signs of progress towards outcomes. The latter is scarcely described upon, conditioning programmatic steering and learning to be based on information about outputs and common sense. This is a missed opportunity as the MTR, as well as the OH exercises, collected numerous ‘early signs of progress’ beyond the sphere of control of the programme. The MTR assessed programme performance towards the programme’s three crosscutting goals: (1) Gender Equality, (2) Lobby & Advocacy (L&A) for an enabling environment and (3) Capacity Development for L&A. The MTR finds clear gender-equality related results (such as empowered women groups, work with women’s caucuses, lobbying for gender quota), in particular in countries where gender was mainstreamed with specific targets into the core of the programme rather than treated as additional work-stream. The other two crosscutting goals are regarded more as ‘processes’ resulting in intermediate goals through which programme outcomes are to be achieved. Efforts and progress in both processes can be observed with different levels of success in all countries. Concerning efficiency, the MTR assessed: (1) the adequacy of key processes, (2) cost-consciousness and (3) budget delivery. Clearly, the programmatic PME process is a widely shared cause for concern, as there are worked out detailed procedures and templates, which however do not provide the insights in programme performance needed for steering and learning purposes. Other critical key processes relate to annual planning and partnership management, which are seen to be left to the discretion of relevant programme staff, resulting in inconsistencies and some frustration. Cost-consciousness is currently acknowledged and treated as a joint NIMD/implementing partner responsibility and, in general, it is seen as being taken seriously. In terms of budget delivery, the programme underperformed in 2016 and performed on target in 2017, though this required re-allocation of funding. Concerning the quality of partnership with the MFA, embassies, implementing partners at country level and international partners were assessed. The partnership with the Department of Stability and Humanitarian Aid (DSH) of MFA can be qualified as challenging, asking for extra efforts, which is explained by the history of DSH’s involvement and the limited insight in meaningful results and analysis of progress towards outcomes, which are needed for more strategic discussions. The quality of partnerships with embassies at the country level ranges from very good to more distant (in the latter case generating a more critical and sceptical attitude at the embassy) and largely depends on the quality of country level reporting and the visibility and perceived quality of the SP partner at a country level. The quality of partnerships with Implementing Partners at the country level is equally varied. On one end, there are partnerships marked by a mutually reinforcing relationship, having a dialogue on content as equal partners. These concern mostly (former) NIMD country offices that have a long history of cooperation. On the other end, there are partnerships in which discussion seem to be more about resources and control, a signal for a struggle to find the right balance between independence and inter-dependence. These concern mostly the platforms where responsibility and control over content and resources are in different hands. The full Executive Summary can be downloaded below. If you would like to view the full Mid-Term Review, these can be requested from Nic van der Jagt, Planning, Monitoring and Evaluation (PM&E) Advisor at NIMD.